GAINFORD Drama Club’s spring production was three of Noel Coward’s one act plays from the set of ten from ‘Tonight at 8.30.’ The three they selected to perform where ‘Hands Across the Sea,’ ‘Fumed Oak’ and ‘Still Life.’ First produced in 1935, they certainly still retain their charm, humour and relevance today. The stories are very different and range from the comedy of mistaken identity in ‘Hands across the Sea.’ ‘Fumed Oak’ saw us meet three generations of the Gow family as their domestic tribulations are revealed. ‘Still Life’ completed the evening with the most recognisable of the three as it was the basis for Brief Encounter. Producing these three plays must have brought many challenges not least with the set and the cast not only playing more than one part, but playing them in different stories. The versatile set was quickly transformed into the three settings and the cast were excellent in each play. A special mention must go to John Chadwick, who appeared in all three plays, and appeared to relish the very different roles each play brought him. 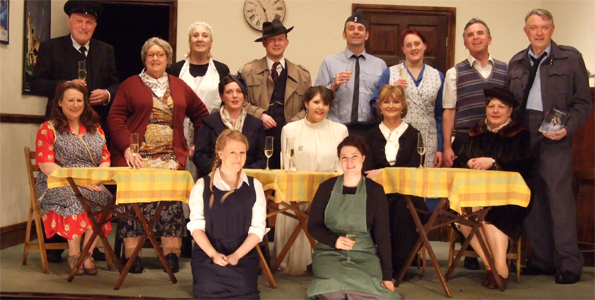 If you haven’t yet seen the Gainford Drama Club they are a group of high quality with a unique theatre space.